Amateur astronomers are a unique species worthy of their own reality TV show. Their craftsmanship, resourcefulness, dedication, and passion is simply amazing. Many professional astronomers rely heavily on amateurs for quick spot checks, discovery followups, collaboration on research projects, the diverse locations of their telescopes and their ability/willingness to put in long hours of observation. So what is spectroscopy, and what do the amateur astronomers get up to? Absorption spectroscopy is the study of the color and light spectrum of stars and galaxies. We all love our Hubble photos and pretty astro-photographs, however most of the real research and science comes from observing the light spectrum. Astronomers look at emission lines and absorption lines in the spectra to determine the make up of stars, nebulas and galaxies. Dopler effects, orbital behavior, elements of stars, even atmospheres can be determined by observing these absorption and emission lines. Scientists believe that a carbon dioxide absorption spectrum line signature in the spectrum of a star with a transiting exo-planet could eventually be the most exciting discovery – a possible indicator of extra-terrestrial life. I asked Ken Harrison the moderator of the Yahoo group – Astronomical Spectroscopy, why amateurs would be interested in absorption spectra? Ken specializes in the spectra of Wolf-Rayet stars and is currently writing a book on amateur spectroscopy. Ken has been building his own spectrographs since 1992 and has used a variety of devices ranging from a simple star analyzer on a digital SLR camera to a sophisticated guided spectrograph. A spectrograph allows light to pass through a narrow slit where it is then split into it’s spectra by passing through some sort of diffraction grating, before being captured on a CCD. The plate scale of the CCD then comes into play as angstroms per pixel instead of the usual (astrometric measure) arc/secs per pixel. Rob Kaufman recently captured a Nova outburst Nova Scuti 2009 (V496 SCT) between the trees and clouds from his back yard. Italian amateur Fulvio Mete has achieved a spectrographic separation of tight binary Beta Aurigea. The double Ha absorption line is easily identifiable in his image taken with a 14inch Celestron. Some of the world’s best telescopes are unable to separate Beta Aurigea optically, so being able to do a spectrographic separation with a back yard telescope is a significant achievement. Perhaps there is no finer example of the quality of the spectroscopy done by amateurs than the current citizen science project on the eclipse of binary Epsilon Aurigae. Robin Leadbeater from Three Hills Observatory, a team member/contributor to the Citizen Sky project and avid amateur astronomer, has documented the changing spectra of Epsilon Aurigae, in particular monitoring the changing KI (neutral potassium) 7699 absorption line during the early stages of the ingress. Robin Leadbeater's Spectrogram of KI 7699 absorption line in Epsilon Aurigae eclipse. The eclipse happens every 27 years and this eclipse will be the first to be fully documented with advanced spectroscopy – clearly alot of that will be performed by skillful amateurs. So what equipment do I need? Ken Harrison comments that the equipment required is not necessarily expensive and it is a lot of fun. Dale Mais another dedicated amateur from Orange Grove, San Diego County has an excellent paper on qualitative and quantitative analysis that can be achieved by amateur astronomers. 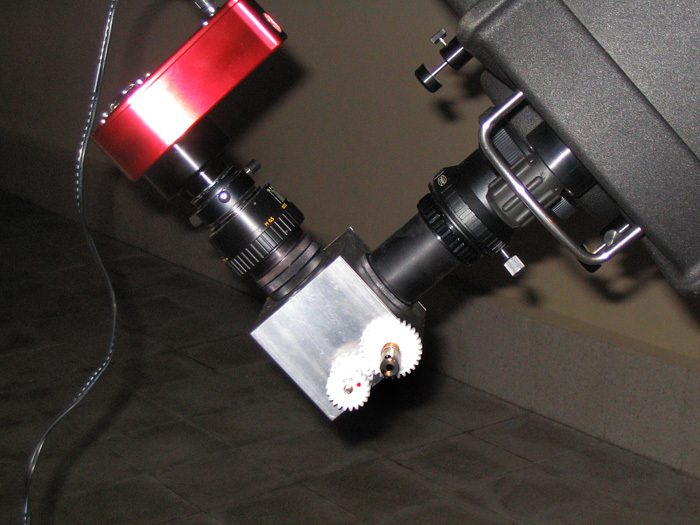 The contribution of amateurs across all forms of astronomy is significant, and spectroscopy is no exception. If you want more information join one of the Yahoo groups or major amateur astronomy forums as they all have discussion groups with experienced people who are keen to help you get started. Special thanks to Ken Harrison, Robin Leadbeater, Rob Kaufman, Fulvio Mete and Dale Mais for your photos and insight!